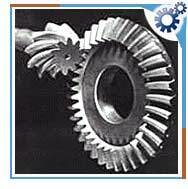 The gears that have non-intersecting shafts are hypoid gears, crossed helical gears and worm gears. These gears provide an effective answer for power transmission applications requiring high-ratio speed reduction in a limited space using non-intersecting shafts. These are ideal for applications requiring only limited load capacity. Lowering ratios easily increases their efficiency. These gears are the cheapest of all gears; the cost of manufacturing is cheapest of all other gears. They are widely used in automobile differentials, electric mixer, speedometer, sprinkler, machine tools, and packaging machinery.